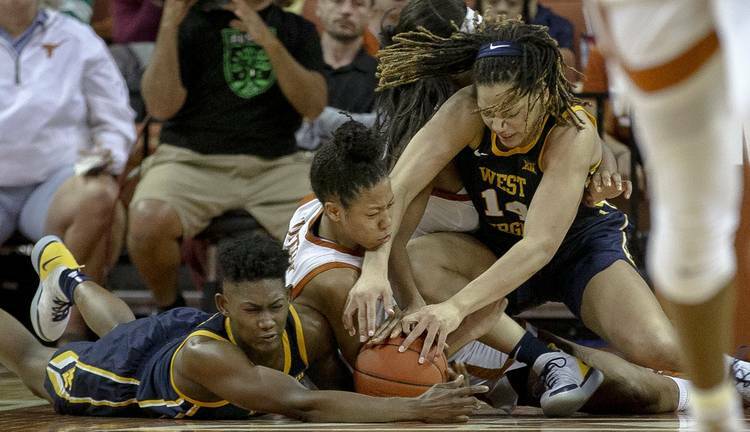 West Virginia guard Tynice Martin hit Texas with a wicked early punch and the Longhorns didn’t respond. Texas coach Karen Aston sometimes uses boxing metaphors to describe her team’s performance. Martin knocked Texas down early — 16 points in the first quarter — and the Mountaineers went on to a 64-58 victory Monday night at the Erwin Center. In the big picture, this was a damaging blow for the Longhorns, who still had hopes of winning the Big 12 title. It was the second conference loss in the last five games and the third home loss of the season. Texas (17-4, 7-2 Big 12) plays at Oklahoma on Saturday, then hosts No. 1-ranked Baylor on Monday. West Virginia improved to 15-5, 6-3. Aston has repeatedly been asked to explain her team’s early-game lapses. Martin couldn’t miss early, the Mountaineers had an 11-0 scoring spurt late in the first quarter, and they would never relinquish the lead. Most of the credit for West Virginia’s victory rested with Martin, who missed the entire 2017-18 season with a foot injury called a Lisfranc fracture. Her performance should not have surprised anyone in burnt orange. The junior guard was an All-Big 12 pick in 2017 before the injury and was the MVP of the Mountaineers’ Big 12 tournament championship victory against Baylor. So when asked if Martin’s night was unexpected, WVU coach Mike Carey said, “I saw the same thing two years ago in Oklahoma City,” referring to the title game. While West Virginia deserves credit for breaking its 0-6 record against the Longhorns in games played in Austin, this was a game Texas could have won. Trailing by as many as 14 points early in the third quarter, the Longhorns staged a rally. When junior guard Sug Sutton knocked in a banker at the buzzer, WVU’s lead was sliced to 62-58 entering the fourth quarter. Texas junior Joyner Holmes played well in defeat, scoring a team-high 16 points. And when teammate Jatarie White hit a short jumper with 6:40 to play, WVU’s lead was 51-49. The Horns would get no closer. And they have only themselves to blame. In the game’s final minute, Holmes missed a point-blank layup, Sutton committed a turnover and Destiny Littleton was whistled for an offensive foul. Carey was so hoarse after the game, his voice was barely audible. He said his team played well considering this was WVU’s fourth game in eight days. The Mountaineers took advantage of 21 Texas turnovers which led to a 24-9 edge in points off miscues. Sutton, who guarded Martin for much of the game, praised the Mountaineers sharpshooter for her extraordinary night. Texas received an energy boost from freshman Joanne Allen-Taylor, who was on the floor for part of UT’s second-half rally. She received extra minutes because fellow freshman Audrey Warren was held out of the game with a concussion that she suffered in Saturday’s victory at Texas Tech. The Longhorns beat Oklahoma 73-63 at home on Jan. 9. Baylor has won the last four meetings with Texas since the Longhorns’ last win on Feb. 6, 2017. They played three times last year, including a 77-69 Bears win in the Big 12 tournament. Aston declined to comment about the Baylor game.